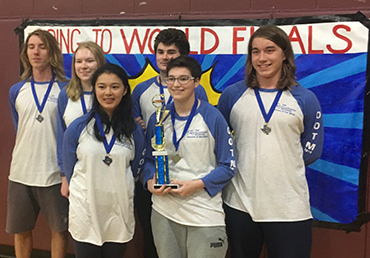 The Clariden high school team (Division III) consisted of Alyssa Bramble (G11), Ani Heng (G9), Damien Kazewych (G9), Danny Kazewych (G11), Sara Norton (G11), and Coby Warner (G11). Team coaches were Brady Warner and Rissa Westerfield. Odyssey of the Mind is a club activity for students at Clariden. The Odyssey of the Mind World Finals Tournament will be held May 22-25, 2019 at Michigan State University. Clariden will compete against approximately 850 top teams from around the world.